Day old cornbread is best, but you can toast the cubes if you prepare the cornbread the day of. Dice cornbread into 1 inch squares and set aside. Preheat oven to 325˚ and lightly grease a 9x13 inch baking dish. In a large pan, sauté the sausage over medium heat until brown, separating it as it cooks. Once brown, add in the diced onion, celery, and garlic. Sauté over medium-low heat until tender, about 10 more minutes. Add in the seasonings: rosemary, dill, oregano, salt, and pepper. Stir to combine. Add in the diced Apple Pear and cook about 5 more minutes, until heated. Place cornbread in a large bowl, and pour the melted butter over to lightly coat. Gently stir in the sausage/Apple Pear mixture. Some crumbling will occur. Heat the chicken broth, either for 2 minutes in the microwave, or on the stove top until simmering. Pour this over the cornbread mixture, again stirring gently. Spoon into the prepared 9x13 dish and bake for 25 minutes. 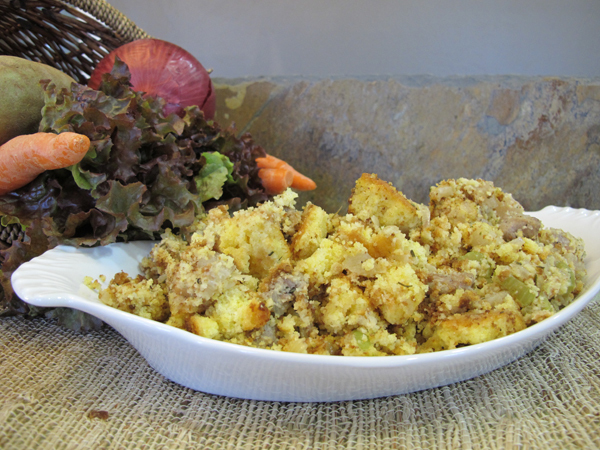 To toast cornbread, cut into 1 inch cubes, spread on a cookie sheet, and bake at 425 for 5 minutes.